New tools for video and film professionals. Last week was the one of the biggest trade shows for film and video production. The NAB trade show is the one to watch for announcements about all the new film and video technology. This year was no different, with a number of exciting announcements coming out of the show. Here are the top three announcements that I find most exciting. 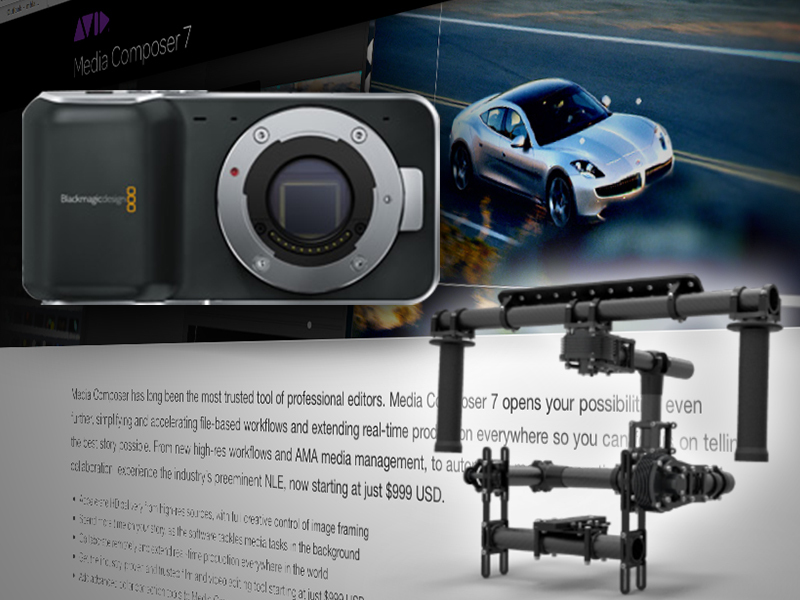 Avid Media Composer v7 - This is the next generation of the Media Composer software. For those of us who have been using the software for a while, we know that although it's version 7, in reality this is the 19th generation of the software. After Media Composer's original (hardware dependent) version 12, Avid decided to start at version 1 when the system became software-only. One bit of news with this new release, is that Avid Symphony is no longer a stand-alone product, but is an option to the Media Composer system. The two biggest additions to the Media Composer, for me is FlexFrame, Media Composer's big move towards resolution independence and the ability to consolidate or transcode your video in the background, while you continue to edit. Blackmagic Pocket Cinema Camera - Here is a great 1080p digital video camera, which is about the size of an iPhone and costs less than $1000. Don't be fooled by the size and cost, this is not just a cheap point and shoot camera, but a tool that is built for the professional market. This could definitely replace my Sony HDR-FX7. The Blackmagic Pocket Cinema camera is a much better camera for a much lower investment than the Sony I have. Not to mention the fact that the Blackmagic is much smaller and gives me a choice of lenses. I will miss having a viewfinder, but that's not a deal-breaker. The Blackmagic Pocket Cinema camera. Freefly Systems MōVI - This system is incredibly cool and may enable a whole new level of creativity from filmmakers. On the other hand, it may be out of reach for those one-person shops that we discussed in the "Is Being Just a Video Editor Enough?" blog. Out of reach in cost (the first model is slated to be $15,000) and the fact that it really requires two operators: one holding the camera rig and the other operator to frame the shot via remote control. Below are a couple of amazing videos that show the system in action. Although there were a whole lot more than three major announcements at the show, these are the ones that I found most interesting. As a disclaimer, I wasn't at the show this year, so these are the announcements that I was able to glean as an outsider. As for the other video tools out there, if Apple had any announcements about Final Cut Pro, I missed them and Adobe is really pushing Adobe Anywhere. I'd be interested in hearing about other announcements that I may have missed.